The Cray Titan awoke at the end of October last year, benchmarking at 17.59 petaflops it’s the fastest of the current generation of supercomputers. Why would you care about a supercomputer when we’re meant to be talking about a big graphics card? Well, Nvidia supplied 18,688 Tesla K20 cards to pack out the Titan and in exchange has nabbed the name to stick on its gaming-focused versions with the same GPU. There was always the feeling that the GK104 GPU at the heart of the GTX 680 wasn’t the fastest implementation of Nvidia’s Kepler architecture way back when I first got hold of our test unit back in March of last year. That was confirmed a few months later when we saw those Tesla K20 professional graphics card, home to the full-fat Kepler core, the GK110. The instant that card was confirmed though we were all here taking bets on how long it was going to take before Nvidia took the plunge and dropped the GK110 into a proper gaming desktop card. None of us thought we would have to wait this long, however, to a time in the year when we were half expecting a new generation of graphics cards to hit. Sadly it looks like the great graphics powers-that-be have decided we don’t need a new generation right now. AMD has announced it’s sticking with the current range of HD 7000 cards right through 2013, and we’re only likely to see a new lineup right at the end of the year. And with the launch of Nvidia’s GTX Titan I would bet that the next line of GTX 700 series cards, based on the upcoming Maxwell architecture, aren’t going to be tipping up until the late-summer at the earliest. Whatever happens with the next generation of graphics cards though it’s going to be incredibly difficult for any new GPU to be able to best the power available to the GK110 silicon. And as such this is probably going to be the fastest single-GPU card we’ll see until Nvidia itself decides to pull the top chip out of the next-gen Tesla cards and offer it up to the desktop gaming crowd. Well, unless AMD does something completely unprecedented with Sea Islands. So, for the foreseeable this is the fastest single-GPU card around. And that’s exactly what Nvidia was after as Tom Petersen, Nvidia’s Director of Technical Marketing, told me a few weeks before launch: "this is without doubt the biggest, baddest, fastest graphics card we’ve ever built. The key thing about it is that it does crush all other single-GPU cards we’ve ever built and it crushes all other single GPUs anyone’s ever built." 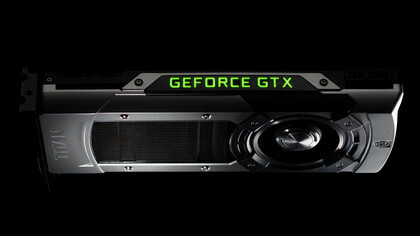 That assertion about its single-GPU credentials is really the key to the GTX Titan. That’s because it’s not actually the fastest graphics card anyone’s ever built, in fact both the EVGA GTX 690 and Club3D HD 7990 we’re putting it up against are faster cards out of the blocks. But is overall straight-line performance the be-all-and-end-all? Nvidia would say no, AMD would say absolutely yes. Before we get into any of that though let’s take a look at what exactly is sitting inside that lovely magnesium alloy chassis. The big thing, and I mean that entirely literally, is the GK110 GPU. Sitting in the middle of the PCB is a vast chunk of silicon with over 7 billion transistors humming away inside. And despite being manufactured on the smallest GPU lithography available to Nvidia, those 28nm transistors still end up making the GK110 chip around 520mm squared in size. Inside that silicon is the most complex and powerful graphics architecture around, with 2,688 single precision and 896 double precision CUDA cores. Those are arrayed over 14 of the familiar Nvidia streaming microprocessors (SMX) set in 5 graphics processing clusters (GPCs). The fully specced GK110 chip has 15 SMX units, but with yields giving more GPUs with 14 functional SMX than with 15 SMX units it was a product decision to ship with one shut down. That doesn’t mean you’re getting less than the Tesla crowd though, the full-fat Tesla K20X is similarly running with 14 SMX units and 2,688 single precision cores. Coupled with the vast number of both single and double precision CUDA cores are 224 texture units and 48 ROPs. Those double precision cores aren’t enabled by default though, you have to turn them on in the Nvidia control panel and that limits the base clock. It’s recommended to keep them switched off when you’re gaming and to throw the switch only when you’re going to be doing some serious compute-based grunt work. And with the Titan the amateur 3D world is going to be rather excited. In terms of clocks, the GTX Titan is set relatively conservatively compared to the GHz GPUs we’ve become used to since the GTX 680 launched. Still, with a boost clock of 876MHz it’s no slouch and with the advances made in the new iteration of GPU Boost there is overclocking aplenty available to this card as a matter of course. Those are all relatively impressive numbers and then you come to the frame buffer. At over 6GB GDDR5, running at over 6GHz, this thing is going to be capable of some incredibly high-resolution gaming. And that’s arguably where this kind of ‘ultra-enthusiast’ card is targeted. With the new HD standard of 4K now very much on people’s radar it makes sense for the very top graphics cards of today to be ready for this new image resolution revolution. So, you’ve got a massive GPU, running at relatively high clock speeds with a huge amount of video memory attached to it. You’re going to need to plumb it directly into Sizewell B, aren’t you? To be honest, this is probably the biggest surprise of this GTX Titan package, it’s actually got a TDP of just 250W. That’s comparable with the TDP of the slower AMD Radeon HD 7970. This is all thanks to the impressively power-conscious Kepler architecture we’ve already seen in the GTX 680, and it means we were able to get a three-way SLI setup running comfortably on a 1,200W PSU without a care in the world. As with the GTX 680, the Titan isn’t just all about the hardware sat on the PCB, the software is almost as important as the actual silicon itself. 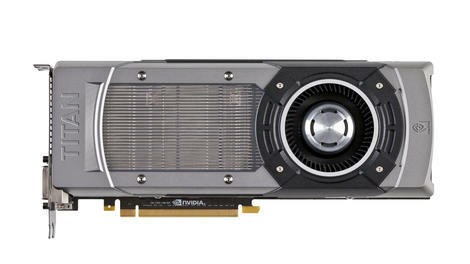 And just as GPU Boost was vital to the success of the GTX 680, so the new GPU Boost 2.0 is just as vital to the GTX Titan. It has to be said though the performance improvements don’t sound that earth-shattering, Tom Petersen estimates it to offer between 3-7% higher frame rates compared with the original GPU Boost. But it’s the way it’s getting there that’s impressive. Where before the focus was on the power the GPU was using it has now been switched around so the GPU clock is automatically boosted in line with the temperature the chip is running at. This has meant that Nvidia can be a lot more cavalier about the voltage it pushes through the chip as it doesn’t have to worry anymore about the perfect-storm combination of high voltage and high temperature. In the original GPU Boost there was no over-voltaging, Nvidia imposed a hard limit on the amount of voltage you could push through to ensure this combination never hit, much to the consternation of the overclocking community. "The reason there is a reliability limit on voltage is because of one thing," says Tom. "When you have high temperatures and high voltage you blow up transistors. We are regulating based on temperature so now we can have both high voltage and high temperatures being a possibility, but they never happen at the same time. Now we can raise the reliability voltage without changing anything else. That single change is a lot of what helps us get that performance boost." So now there is a higher standard voltage, as well as the option to opt-in and allow over-voltaging within whichever overclocking software you choose to use on your expensive ol’ card. You can specify a temperature you want to hit as a limit for your card and the software will automatically adjust clock speed and voltage in an effort to boost the GPU as much as it can within the boundaries of that temperature limit. With the reference cooling design that enabled me to get up to around 1,175MHz, but with a quality water-cooling block that could be raised significantly. "The other thing that’s really cool about doing temperature-based control," says Tom, "is that chassis, water-blocks and everything else that makes a GPU run colder is actually now going to make it run faster." Now if that isn’t a reason to upgrade your dusty, creaking chassis I don’t know what is. Sadly though GPU Boost 2.0 is limited to this GPU and those that are to come after, there are no plans to retroactively fit it to older cards. But what does that all mean for performance? Well, it means base performance is actually quite tough to accurately measure. Each GTX Titan will perform slightly differently and that can be based on not just different GPUs but also on varying environmental conditions. That said my test card clock was happily topping the 1GHz mark without my even touching the overclocking controls. Sadly that also meant that when I did start getting happy with the EVGA Precision OC tools, and stuck a 120Hz offset onto the base clock, I wasn’t really seeing much in the way of actual frame rate improvements. I can though comfortably confirm that the GTX Titan is the fastest single-GPU graphics card on the market. But it’s kind of not actually fast enough. For the most part it’s around a third faster than the preceding GTX 680, and in general around 15-20% faster than the top-end HD 7970 we’ve tested. There are a lot of variations compared with the Radeon silicon though, with some game engines running 45% faster on the Titan and one in particular, DiRT Showdown, actually running a couple FPS slower than the HD 7970. All our tests were run at 2560×1600 to show performance on high-res systems and what’s immediately evident from the benchmarks is that the Titan isn’t the fastest graphics card around, but it’s hitting close to SLI performance from just a single GPU. That’s important because of the difficulty getting a consistently pleasing multi-GPU experience. Compared with the other single-GPU cards though it’s a good deal quicker for the most part, though the DiRT Showdown score is a bit of an anomaly and shows just how impressive AMD’s GCN tech is for compute-based game engines. If you thought one GTX Titan might be a bit of overkill, then let us take that to an extreme with three of them jammed into a X79 rig with an eight-core Xeon. You know, just for kicks. SLI performance has improved, but you can see how little benefit you actually get from adding a third card. Two cards gives a fairly hefty boost, but at best a third will only give you another 40% FPS. The important thing though is it’s not close to twice as fast given that it is retailing at more than twice the price of the top-spec, suddenly second-tier, single-GPU graphics cards. 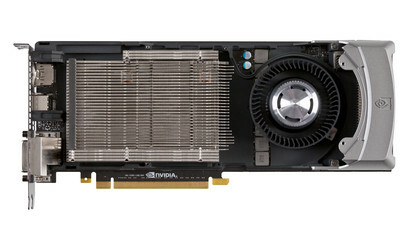 It also posts consistently lower benchmark scores than either the cheaper EVGA GTX 690 or the Club3D HD 7990. Now, I completely understand that this straight-line performance comes at a cost to your sanity, such is the way with multi-GPU solutions, but by all established logic you would have to say the GTX Titan ought to be at least the same price as these faster cards, if not cheaper. 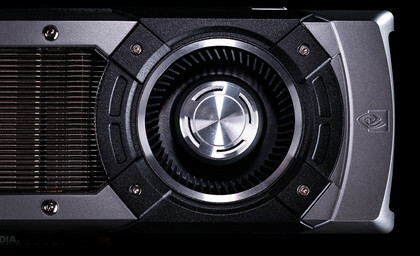 But Nvidia isn’t just looking to make a substantial profit by pricing its Titan at over £800, it’s making a statement. That statement though is that this card is not for you. This is an aspirational product, built in relatively low numbers for a niche market, mostly so it can point to the card as the fastest single-GPU on the planet. It’s not really an enthusiast part either, Nvidia is calling the new segment ultra-enthusiast, but that’s almost disingenuous too. The sort of person that’s going to own this card is unlikely to necessarily even know it’s there. They’ve got this card as part of a custom-built PC, bought as a whole, with the proviso given to the system integrator that they want the best PC gaming experience on offer. There is no doubt the Titan will offer a great PC gaming experience though, and even if you don’t sign up to Nvidia’s money-no-object strategy for this card, it’s an eminently desirable device. It will run any game you throw at it, at incredibly high-resolutions, and doesn’t suffer from any of the vagaries of multi-GPU gaming to get you there. It’s also very discrete too, offering all that power without a huge demand on your PSU or on your eardrums. And it’s a beautifully engineered product, a truly lovely slice of high-spec, high performance tech that you’ll desperately want if you ever come to hold one in your hands. But it’s not an upgrade. It’s not a card many people are likely to ring up Scan or Dabs and order for their existing machine. You don’t buy this card for your 24-inch screen gaming setup, or if you do it’s because you couldn’t afford this chip in its Tesla guise, but still have a penchant for 3D modelling. But mostly you’ll buy this as part of a premium system, with a vast display array and you’ll be very happy once the buyer’s remorse has subsided. It’s a terrible shame that it’s been priced out of the reach of most of us mere mortals and it’s sad to think this is the fastest single-GPU card we’ll see for a good couple years, but the Titan is still a slick and impressive feat of both design and engineering. 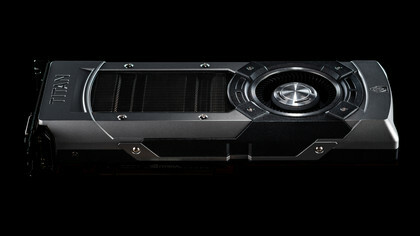 The GTX Titan is a card you’ll no doubt want but are unlikely to be able to afford. 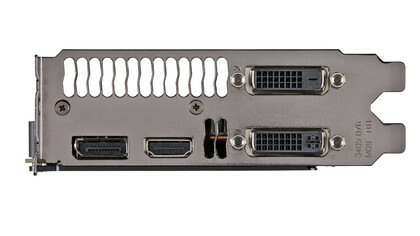 But as a high-res gaming experience it’s immense, and as a ‘budget’ pro-compute card it’s unsurpassed.